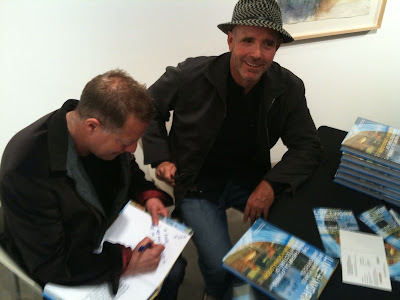 On Saturday Night, April 17 th Robin and Russell were thrilled to see a big turn out of our friends and clients for a book signing and brief talk at Edward Cella's galleryhttp://www.edwardcella.com/html/home.asp on Wilshire Blvd in LA. We also had a "pop up" exhbition of photos and models of recent projects. Edward is a brilliant gallerist and he has a great eye for interesting architectural collectibles and fine art. thank you to Edward and staff for making this happen. Also to Julie Taylor and Oro Editions for all your support and great work on behalf of LIVE + WORK. SHUBIN + DONALDSON ARCHITECTS INC.